I recently applied for UK visa which was refused. I overstayed years ago when I was in school. Thereafter in 2013 I was given a 6 Months visa which wasn't used. I then applied in 2017 for a Conference I was denied because I failed to disclose a court order in my application. I applied again last month but guess what? I was told they called my office number found on the website just to confirm my employment and the Front-Desk officer picked the call twice and tried to transfer to me without success. This recent application was to be sponsored by my Employer. I had Letter of Introduction, Pay-Slip, Bank statement as evidence. At this point, your employment verification doesn't seem like the biggest issue. The ECO even put it at the end after the "your application has therefore been refused" line. Your history with UK Immigration and your bank balance are significant issues right now. You have an overstay on your record and further hurt your credibility by failing to disclose a conviction. This already hurts your chances substantially, so any hope of a successful application needs to be rock solid. But you've submitted a bank statement showing a closing balance of £8.61. At that point, it's over; the ECO is going to look at that and not be comfortable you won't overstay in the UK. Even though your employer is paying toward the cost of the trip, your personal circumstances help demonstrate that you'll return home to Nigeria, and you haven't demonstrated that. You can address the employment verification issue by making sure your employer is able to handle a simple telephone call, but there's no point in considering reapplying until you have a solid financial history to provide. 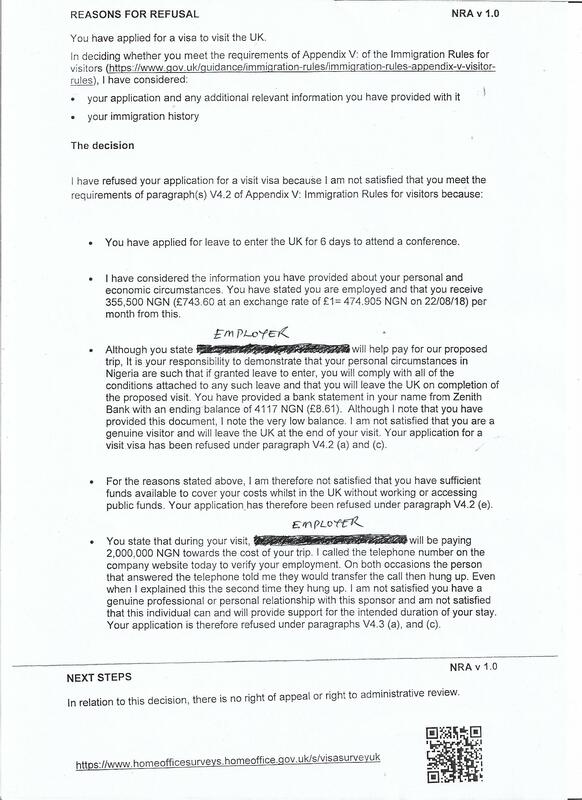 Please read Should I submit bank statements when applying for a UK Visa? What do they say about me? for an idea of what they're looking to see. Incidentally, this will also help verify your employment: a regular history of salary deposits on your bank statements demonstrates that you're employed, paid as you've stated, and are living within your means. It’s quite clear - you didn’t satisfy the ECO that your intentions are genuine (unsurprising, given your immigration history), nor did they find your claim of employer sponsorship credible (presumably because you provided no real proof of this). https://www.gov.uk/guidance/immigration-rules/immigration-rules-appendix-v-visitor-rules IMHO there’s nothing you can do to rescue the situation - you won’t be visiting the U.K. any time soon, if ever. Not the answer you're looking for? Browse other questions tagged uk visa-refusals denial-of-entry criminal-records or ask your own question.